The relationship between market orientation and firm performance have been explored from a several researchers. Even so, there is a gap that can be developed from that relationship, especially if associated with the firm performance measured. This study aims to explore the relationship between market orientation and marketing performance with product innovation as a mediating variable. The data collected from 150 respondents with purposive sampling technique. The results showed that there is a positive relationship between market orientation and all of marketing performance measurement. Furthermore, the study also found that product innovation is mediating the relationship between market orientation and marketing performance. The implications of the research findings have been discussed and there are some recommendations for the future researchers. Appiah-Adu, K. (1998). Market orientation and performance: Empirical tests in a transition economy. Journal of Strategic Marketing, 6(1), 25–45. Arief, M., Thoyib, A., Sudiro, A., & Rohman, F. (2013). The Developing Framework On The Relationship Between Market Orientation And Entrepreneurial Orientation To The Firm Performance Through Strategic Flexibility : A Literature Perspective. European Journal of Business and Management, 5(9), 136–150. Baker, W. E., & Sinkula, J. M. (2002). Market Orientation, Learning Orientation and Product Innovation: Delving into the Organization’s Black Box. Journal of Market-Focused Management. 5(1), 5-23. Baker, W. E., & Sinkula, J. M. (2005). Market orientation and the new product paradox. Journal of Product Innovation Management, 22(6), 483–502. Blankson, C., & Cheng, J. M. S. (2005). Have small businesses adopted the market orientation concept? The case of small businesses in Michigan. In Journal of Business and Industrial Marketing, 20, 317–330. Božіč, Ljiljana. (2006). The Effects of Market Orientation on Product Innovation, Economic Trends and Economic Policy, 107, 46-65. De Jong, P. J., & Vermeulen, P. A. M. (2006). Determinants of product innovation in small firms: A comparison across industries. International Small Business Journal, 24(6), 587–609. Deng, S., & Dart, J. (1994). Measuring market orientation: A multi-factor, multi-item approach. Journal of Marketing Management, 10(8), 725–742. Desphandé, R., & Farley, J. (1998). Measuring Market Orientation: Generalization and Synthesis. Journal of Market Focused Management, 2, 213–232. Doyle, P. and Hooley, G.J. (1992). Strategic orientation and corporate performance. International. Journal of Research in Marketing, 9, 59-73. Drucker, P. (1954). The Practice of Management, Harper and Row, New York. Esslemont, D & Lewis, T. (1991). Some empirical tests of the Marketing Concept. Marketing Bulletin, 2, 1-7. Fatonah, S. (2017). The impact of market orientation and marketing strategies on performance of SMES in batik industry. International Journal of Civil Engineering and Technology, 8(8), 1290–1298. Greenley, G. E. (1995). Market Orientation and Company Performance: Empirical Evidence From UK Companies. British Journal of Management, 6(1), 1–13. Grinstein, A. (2008). The effect of market orientation and its components on innovation consequences: A meta-analysis. Journal of the Academy of Marketing Science, 36(2), 166–173. Gujarati, D.N. (2012). Dasar-dasar Ekonometrika, Terjemahan Mangunsong, R.C., Salemba Empat, buku 2, Edisi 5, Jakarta. Haribowo, I.N. (2017). Pengaruh Pengumuman Likuidasi Bank Terhadap Minat Menarik Uang Dari Bank. Modus, 29(1): 17-35. Homburg, C., & Pflesser, C. (2000). A Multiple-Layer Model of Market-Oriented Organizational Culture: Measurement Issues and Performance Outcomes. Journal of Marketing Research, 37(4), 449–462. Johnson, A. J., Dibrell, C., & Hansen, E. (2009). Market Orientation, Innovativeness, and Performance of Food Companies. Journal of Agribusiness, 27(1/2), 85–106. Kanagal, N. (2015). Innovation and product innovation in marketing strategy. Journal of Management and Marketing Research, 18, 25. Kohli, A.K. & Jaworski, B.J., (1990). Market Orientation: The Construct, Research Proposition and Managerial Implication, The Journal of Marketing, 54(2), 1-18. Kumar, V., Jones, E., Venkatesan, R., & Leone, R. P. (2011). Is Market Orientation a Source of Sustainable Competitive Advantage or Simply the Cost of Competing? Journal of Marketing, 75(1), 16–30. Lukas, B. A., & Ferrell, O. C. (2000). The effect of market orientation on product innovation. Journal of the Academy of Marketing Science, 28(2), 239–247. Pelham, A. M., & Wilson, D. T. (1996). A longitudinal study of the impact of market structure, firm structure, strategy, and market orientation culture on dimensions of small-firm performance. Journal of the Academy of Marketing Science, 24(1), 27–43. Rosmayani, Suryana, Y., Suwawihardja, S., & Helmi, R. A. (2016). Influence Of Market Orientation And Innovation On Marketing Performance In Small Industry Of Malay Woven Textile, Riau Province, Indonesia. International Journal of Economics, Commerce and Managementmmerce and Management, 4(2), 521–536. Scholastica, E., U. & Maurice, I., U. (2013). The Relationship Between Market Orientation Firm, Innovativeness And Business Performance Of Companies In Nigeria, International Journal of Asian Social Science, 3(11), 2350-2362. Slater, S. F., & Narver, J. C. (1996). Competitive strategy in the market-focused business. Journal of Market-Focused Management, 1(2), 159–174. Sumiati. (2015). Pengaruh Strategi Orientasi Wirausaha dan Orientasi Pasar Pengaruhnya Terhadap Kinerja Perusahaan UMKM di Kota Surabaya. 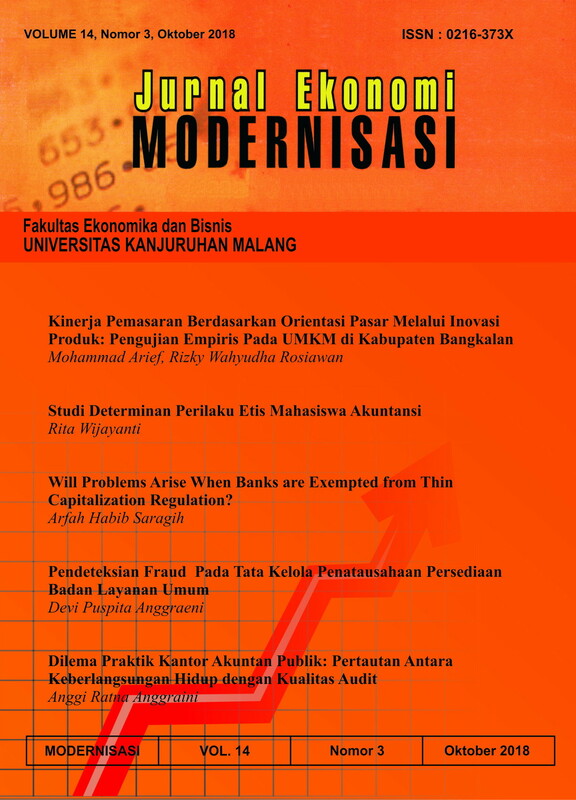 Jurnal Ekonomi & Manajemen, 1(1), 31–44. Suparman, & Ruswanti, E. (2017). Market Orientation, Product Innovation on Marketing Performance Rattan Industry in Cirebon Indonesia. IOSR Journal of Economics and Finance (IOSR-JEF), 3(8), 19–25. Tse, A. C. B. (1998). Market orientation and performance of large property companies in hong kong. International Journal of Commerce and Management, 8(1), 57–69. Varadarajan, R., & Jayachandran, S. (1999). Marketing strategy: An assessment of the state of the field and outlook P. Journal of the Academy of Marketing Science, 27(2), 120–143. Vega-Vázquez, M., Cossío-Silva, F. J., & Martín-Ruíz, D. (2012). Does the firm’s market orientation behaviour influence innovation’s success? Management Decision, 50(8), 1445–1464. Verhees, F. J. H. M., & Meulenberg, M. T. G. (2004). Market Orientation, Innovativeness, Product Innovation, and Performance in Small Firms. Journal of Small Business Management, 42(2), 134–154. Veysi, C., Hajipoor, E., & Irandost, M. (2015). The Effect of Market Orientation on Product Innovation (Shahr-e Koti Walid Studied Hyatt Industrial City of Sanandaj, Iran). Journal of Exploratory Studies in Law and Management, 2(2), 100–110. Vorhies, D. W., & Morgan, N. A. (2003). A Configuration Theory Assessment of Marketing Organization Fit with Business Strategy and Its Relationship with Marketing Performance. Journal of Marketing, 67(1), 100–115. Zhang, J., & Duan, Y. (2010). The impact of different types of market orientation on product innovation performance: Evidence from Chinese manufacturers. Management Decision, 48(6), 849–867.